In this generation when everything is instant and handy, we have a high regard for our ease and comfort. The thing is as much as possible, when you can finish a task that will take 8 hours to do for only an hour, you will buy that idea. And life is changing no matter what field you belong to. The tools that we are using today are not the same anymore with the tools that our grandfathers used when they were still young say, for example, chainsaws. When we hear the word ‘chainsaw,’ what actually comes into our minds is that these are very heavy equipments and only professional handlers can use them. Well, that is correct. There are specific trained people who are licensed to use this. Aside from that, there is a standard for body built because of weight issues of the tool. Nowadays, don’t you know that chainsaws reduced in weight and they became household tools? Well, the former type of chainsaw would require you extreme level of maintenance because they are dedicated to a heavier type of job. But cordless chainsaws are the newest type of chainsaws that you can bring wherever you want to go and use for several purposes – from felling, cutting, etc. If you want to learn more about this, read cordless chainsaw reviews. 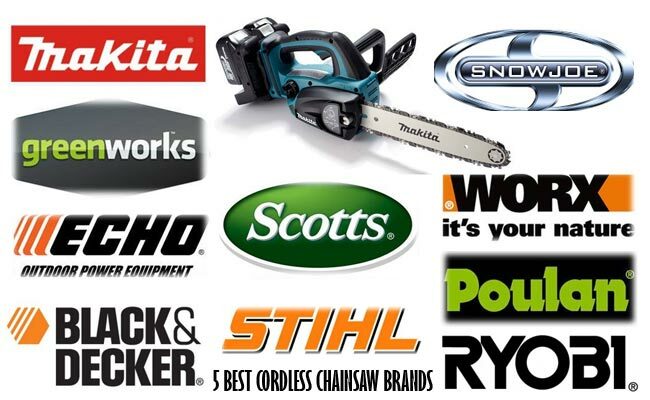 To give you an initial idea of the best cordless chainsaw brands, here they are (not in order). 1. Makita. Being there for a hundred years already, Makita has already made a name for itself as an innovator. This company started in 1915, and until now it is still dedicated to bringing power tools and other equipments for the benefit of those who are passionate about doing different kinds of jobs. It has several cordless chainsaw models like the XCU01Z, XCU02Z, HCU02C1, and HCU02ZX2. What’s good about Makita models is the charging time for batteries because it is too short. Models use lithium-ion batteries. 2. Snow Joe. If you happened to see the logo of Snow Joe, you might have seen the Sun Joe as well. This explains why the innovative company’s tools can be used in all seasons as it states in its About page, “whether the snow is falling or the sun is shining. Our expansive line of outdoor power equipment.” So if you are looking for tools that manual, automatic, and cordless based, this is for you. 3. Black and Decker. From lawns and gardening tools to power tools, this American manufacturer company never stops innovating. Black and Decker cordless chainsaw models are well-designed and handy that range to different voltages from 20V to 40V. Black and Decker tools have good reviews from previous users and you better check that out before making a purchase. Also, there are several models of Black and Decker cordless chainsaws that you can choose from. 4. Greenworks. If you want to see good-looking cordless chainsaws, better check Greenworks. The main advantages of using Greenworks products include the batteries are compatible with different tools and there is less maintenance in them. By the name itself, this company is dedicated to preserving a safe environment to everyone that is why it has “Green” in it. Try Greenworks and experience its friendly customer care. 5. STIHL. Another company on the list is STIHL, otherwise known as Andreas Stihl AG & Company. If you want a taste of German technology, this is for you. The main advantage of using STIHL cordless chainsaw is that it is noise sensitive. You can use STIHL cordless chainsaws in residential areas and you have no problems about the noise. Normally, a chainsaw is a noisy power tool, but not for STIHL. There are other good cordless chainsaw brands out there that are not on the list that you can check out. Mind you, cordless chainsaws are handy equipments that you can make use of for doing household chores. It means to say that there is a limitation on the weight of the job that they can perform. Do not use these chainsaws in doing heavy jobs because they might get damaged. For proper usage and instructions, read the manual or ask someone who is knowledgeable about it. It is advisable for you to read reviews as well for comparison of different brands and models.